Louis Vuitton founded his fashion house Louis Vuitton Malletier in 1854 in Paris, France. The brand is mainly known for their luxury small leather and travel goods, but started to manufacture watches in their first workshop at La Chaux-de-Fonds, Switzerland in 2002. 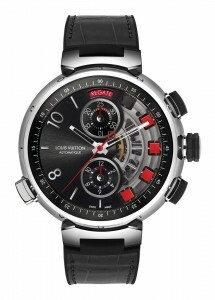 The first Tambour models were launched later that year. By 1983 Louis Vuitton was taking part in the America’s Cup and formed the Louis Vuitton Cup, a preliminary competition to select the team to sail as the challenger in the America’s Cup. 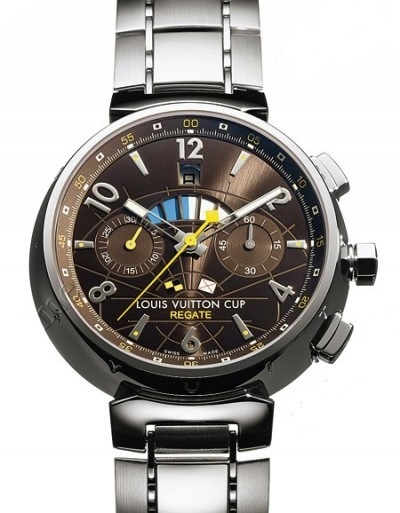 In 2004 Louis Vuitton launched the Tambour LV Cup Régate watch, ref. Q10210. Many different versions would follow in the next few years. 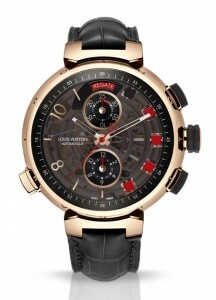 Several versions of the Louis Vuitton Tambour LV Cup Régate. 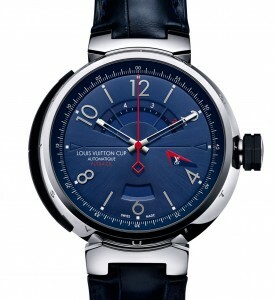 Model: Louis Vuitton Tambour LV Cup Régate automatique. Q 10210 steel case, brown dial with steel bracelet. Q 10211 steel case, brown dial with leather strap. Q 102G1 black PVD coated steel case, black/silver sunray dial with black coated leather strap. Tambour LV Cup Régate automatique Platine, limited to 20 pieces. Q 10271 platinum case, silver sunray dial with camel alligator strap. 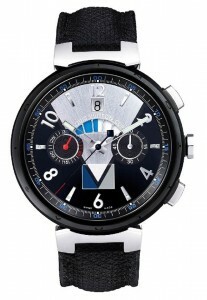 Q 102M platinum case, blue/silver sunray dial with black rubber or leather strap. 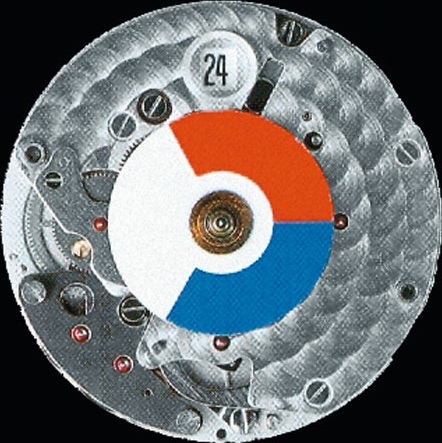 which is a base caliber ETA 2892-A2 with a Dubois-Dépraz 2140 regatta module. Case size: Ø 44 mm / H 16 mm. During the Louis Vuitton Trophy in Dubai, November 2010, the brand introduced the new Tambour Regate Navy Automatique, in a limited edition of 250 pieces. 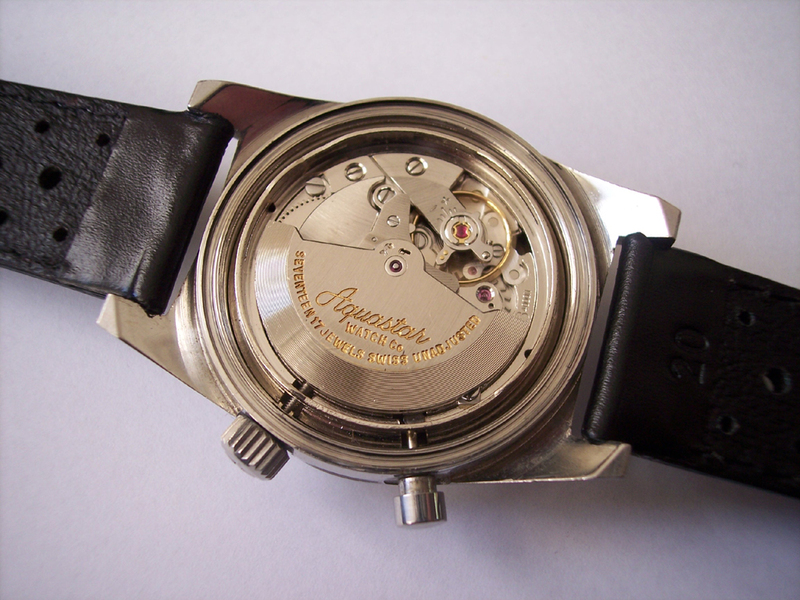 Followed by the Tambour Regate Navy, with a quartz ISA 8270 movement. Also limited to 250 pieces. 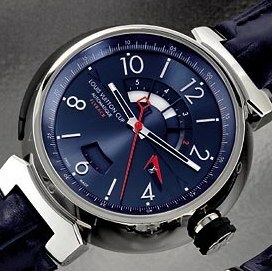 Tambour Regate Navy, with mechanical and quartz movement. 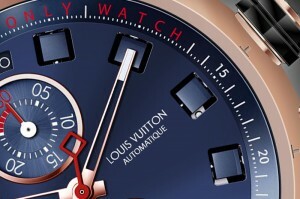 Model: Louis Vuitton Tambour Régate Navy. Reference: Q102D0 stainless steel case, blue/black dial with a black sewn rubber strap. Caliber: quartz ISA 8270 movement with an adjustable countdown from 1 to 10 minutes. 2012. 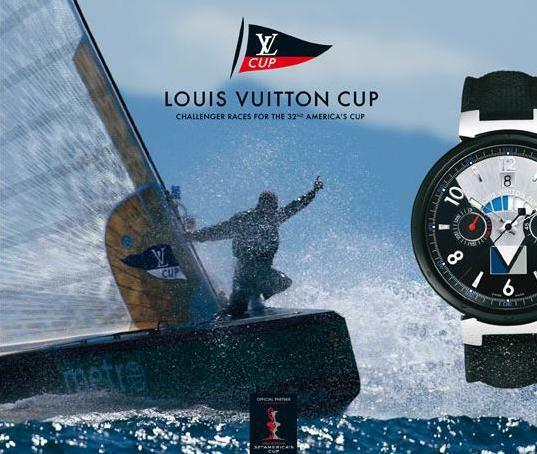 With the upcoming 34th America’s Cup in 2013, and Louis Vuitton being the official timekeeper, the brand launched two new watch models to mark the event, the Louis Vuitton Regatta America’s Cup with either an automatic mechanical or a quartz movement. With the arrival of the extremely fast AC72 catamarans for both the Louis Vuitton Cup and the America’s Cup, the racing rules have been changed with a first gunshot 5 minutes prior to the start of the regatta. Therefore the mechanical version has a 5-minute (4 + 1) countdown, with two windows in the dial. 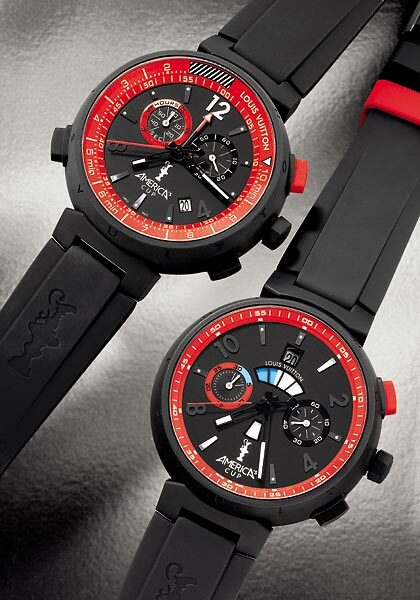 Tambour Regatta America’s Cup mechanical and quartz. 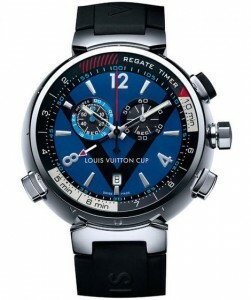 Model: Louis Vuitton Tambour Regatta automatic America’s cup , limited to 720 pieces. 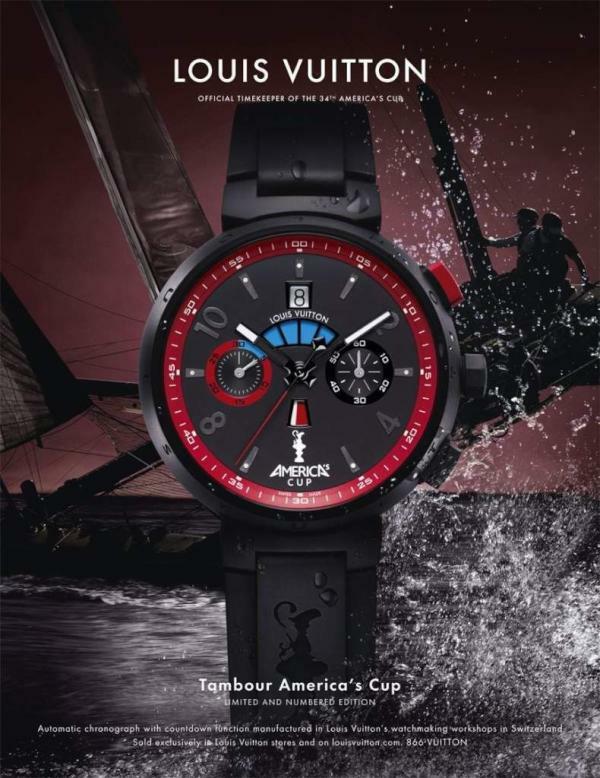 Reference: Q102H0 steel with black rubber moulded case, black and red dial with the America’s cup logo with a black rubber strap. 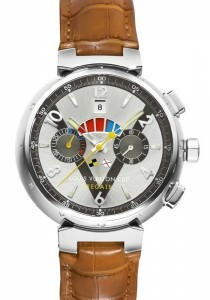 Caliber: automatic LV 171 flyback chronograph movement with Dubois-Dépraz regatta module. 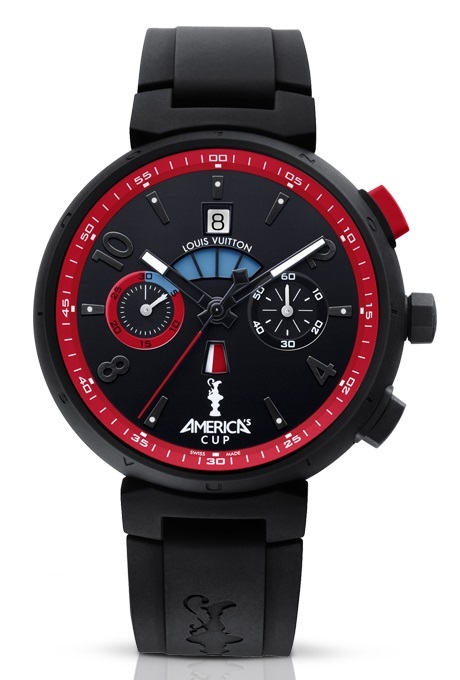 The mechanical version of the Tambour Regatta America’s Cup is available as a limited edition of 720 numbered pieces, in reference to the size of the competing catamarans with rigid wing sails, 72-foot AC72’s. 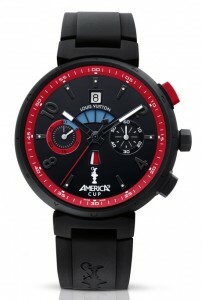 Model: Louis Vuitton Tambour Regatta quartz America’s cup , limited to 1851 pieces. 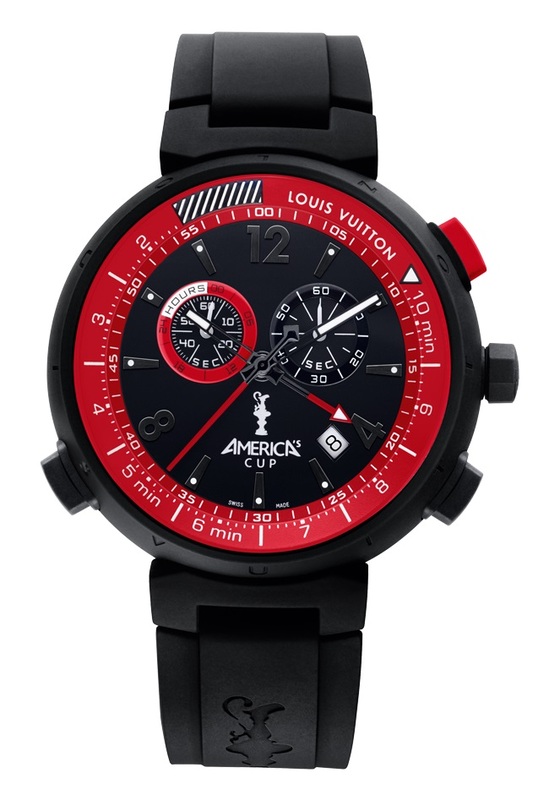 Reference: Q101A0 steel with black rubber moulded case, black and red dial with the America’s cup logo with a black rubber strap. 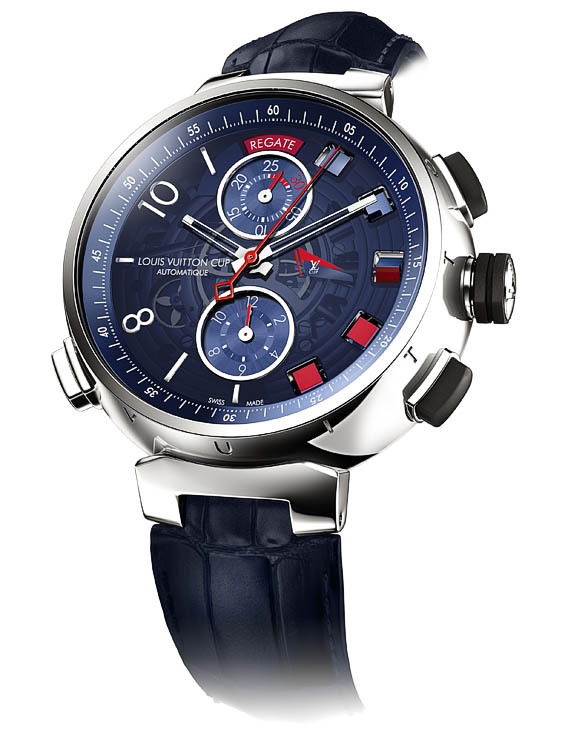 The quartz version of the Tambour Regatta America’s Cup is available as a limited edition of 1851 numbered pieces, in reference to the date which the America’s Cup was founded 22 August 1851, in the presence of Queen Victoria. As major fashion house Louis Vuitton designed their LV Cup collection 2012 for sailing enthusiasts as well as urbanites seeking a nautical style (ready-to-wear, leather goods, shoes and accessories). 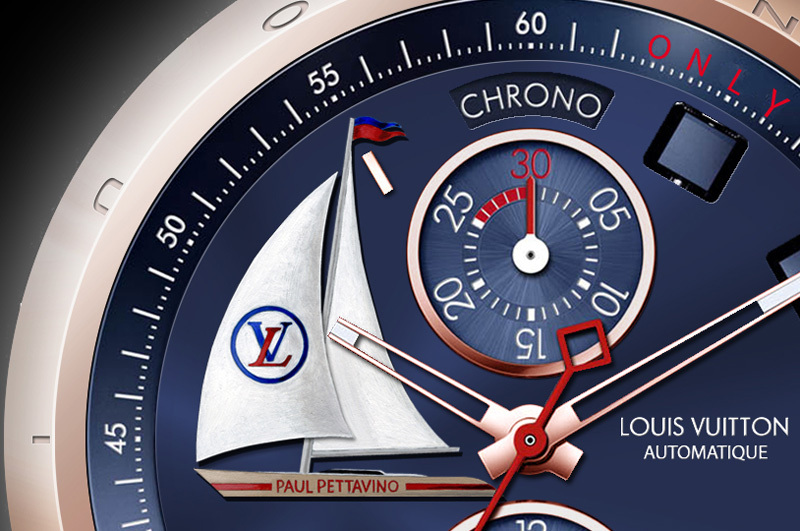 And to mark the 10th anniversary of the Tambour line, the LV Cup collection 2012 also contains a new regatta watch, the Tambour LV Cup Automatic Countdown. 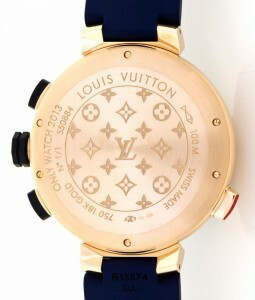 It has the LV Cup logo engraved on the back and displayed on the dial. Tambour LV Cup Automatic Countdown. Model: Louis Vuitton Tambour LV Cup Automatic Countdown. Reference: Q103D0 stainless steel case, sunray navy blue dial with a navy blue alligator strap. Caliber: automatic LV 138 flyback chronograph movement with a Dubois-Dépraz regatta module. The watch has the crown to set the time at 3 o’clock, and two pushers to activate the 5-minute countdown are placed on the opposite side of the crown. 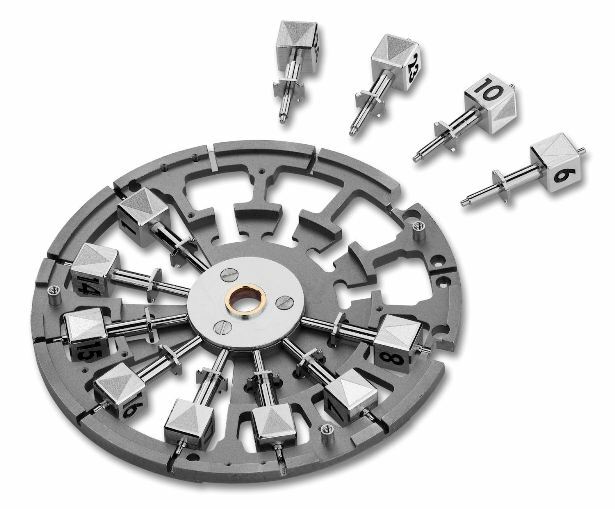 Both the crown and pushers are overmolded with rubber. After starting the countdown the first 4 minutes tick by through a large aperture in the dial between 10 and 2 o’clock, while the last minute is displayed in red through a smaller aperture at 6 o’clock. 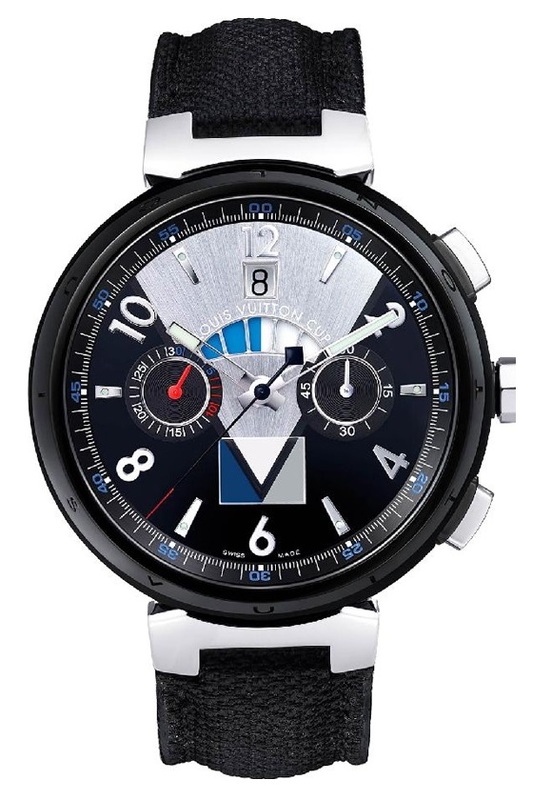 In 2010 Louis Vuitton had introduced the extraordinary Tambour Spin Time collection, where the hours are revealed by cubes which rotate simultaneously to show either a neutral or a numbered face thanks to a unique and patented mechanism. 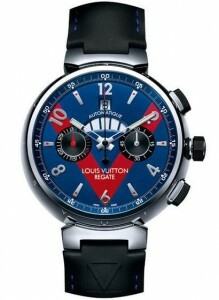 In 2012 the brand launched the Louis Vuitton Tambour Spin Time Regatta (white gold and titanium version). 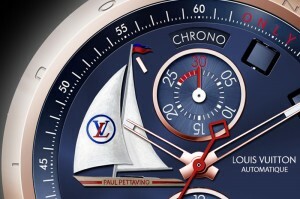 The innovative movement can be used either as a chronograph or as a 5-minute regatta countdown, visually indicated on the dial by 5 rotating cubes. 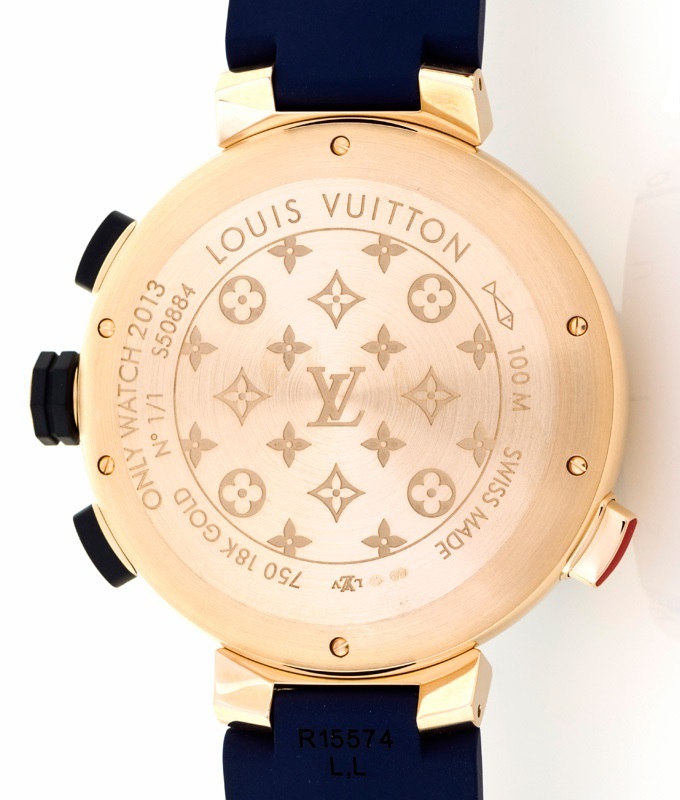 In 2013 a pink gold version followed in a limited and numbered edition of 100 pieces. Louis Vuitton Tambour Spin Time Regatta with white gold, pink gold and titanium case. 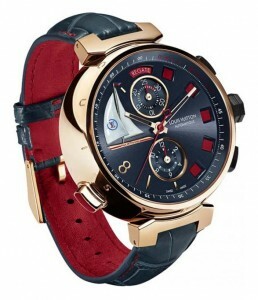 Model: Louis Vuitton Tambour Spin Time Regatta. Reference: Q102J0 white gold case, blue sapphire dial with the LV Cup logo with a blue alligator strap (2012). with a dark grey alligator strap (2013). Titanium case, black dial with leather/rubber strap (2014). 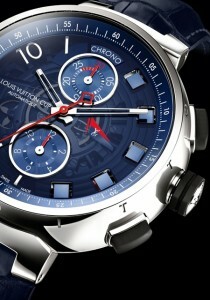 Caliber: automatic LV 156 chronograph movement. Case size: Ø 45,5 mm / H 16 mm. 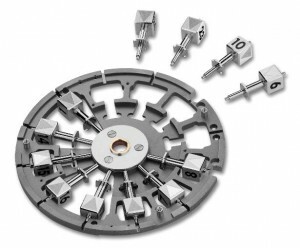 The picture shows how the rotating cubes of a regular Spin Time watch are configured in the dial. Normally the 12 cubes mark the hours, but in a Tambour Spin Time Regatta only 5 cubes are used showing the 5-minute countdown of the race. The watch has the crown to set the time at 3 o’clock, one pusher at 2 o’clock for start/stop and one pusher at 4 o’clock for reset. Again the crown and pushers are overmolded with rubber. 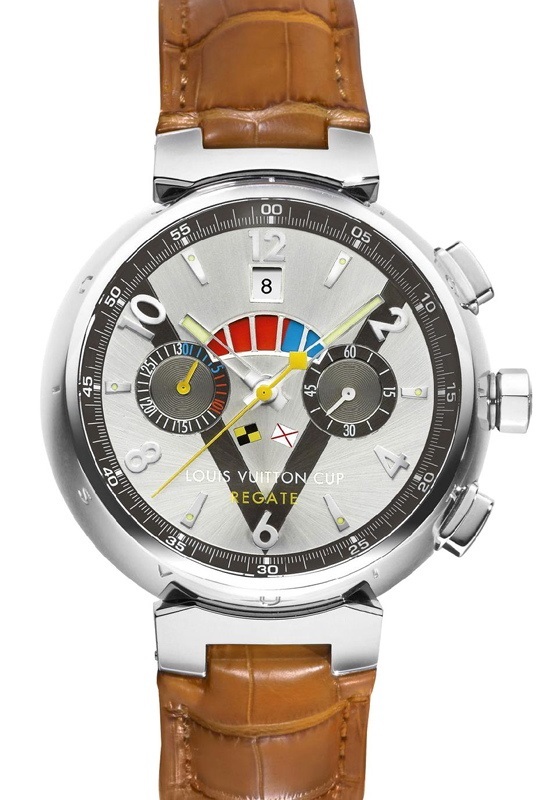 It has a subdial at 12 o’clock with a 30-minute register and a 12 hour register in a subdial at 6 o’clock.At 8 o’clock there’s a red pusher to choose between the ‘chrono’ or ‘regate’ function, indicated in a small aperture in the dial at 12 o’clock. As a chronograph the watch operates normally and the cubes have no function, but by selecting the regatta function, the 5 cubes turn red and the 30-minute register will leap rightward and move the 5-minute countdown displayed in red into counter. This way the minutes before departure are taken into account in the final measured time. The countdown will be indicated by the changing colours of the five cubes on the right hand side of the dial. Since 2005, during the Monaco Yacht Show, generous watchmakers participate for the exceptional Only Watch charity auction, to raise money for neuromuscular diseases in general and Duchenne muscular dystrophy in particular. The concept for each contribution is to create a truly exceptional and indeed one-off piece. 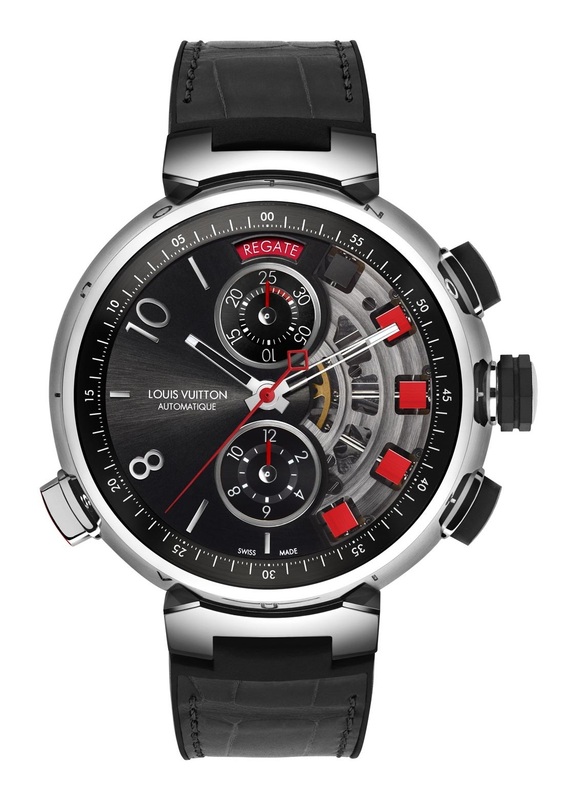 In 2013 Louis Vuitton has participated in the event for the fourth time, by offering a unique Tambour Spin Time Regatta watch, designed in collaboration with the young Paul Pettavino (struggling with the disease himself) and the Louis Vuitton team. http://www.louisvuitton.com/front/#/dispatch with several press releases.